Everything Guardians need to know about the bounties available in Destiny 2. With update 1.2.3, Bungie is bringing bounties back to Destiny 2, and they are intended to look a lot like they did with Destiny: The Taken King. This guide will look at the vendors that currently provide bounties, what activities they apply to, and the rewards that are earned through completion. Currently, only two vendors appear to sell bounties, Commander Zavala and Lord Shaxx. 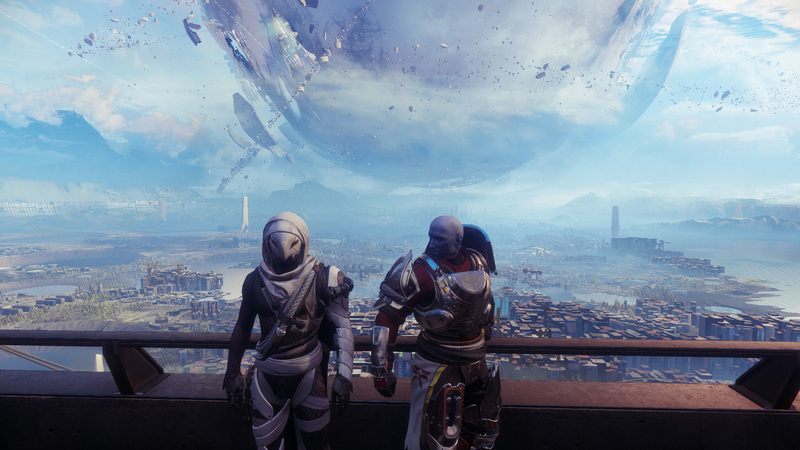 I visited each of the vendors in the Tower, as well as several vendors throughout Destiny 2’s numerous destinations, and the only two NPCs that provide bounties as of right now are Zavala and Shaxx. What this means is that these bounties are only relevant to those who are participating in strikes and the Crucible, so don’t expect to grab some bounties and complete them while working through Cayde’s flashpoint milestone. Travel to the Tower in Destiny 2 and visit with either Commander Zavala or Lord Shaxx. They will have the available bounties listed. There will be five available bounties for each. A single bounty will require that Guardians spend 250 Glimmer to acquire it, and they have only 24 hours to complete it. Should the bounty be incomplete at the end of the 24 hours, it will expire, and no reward will be given. 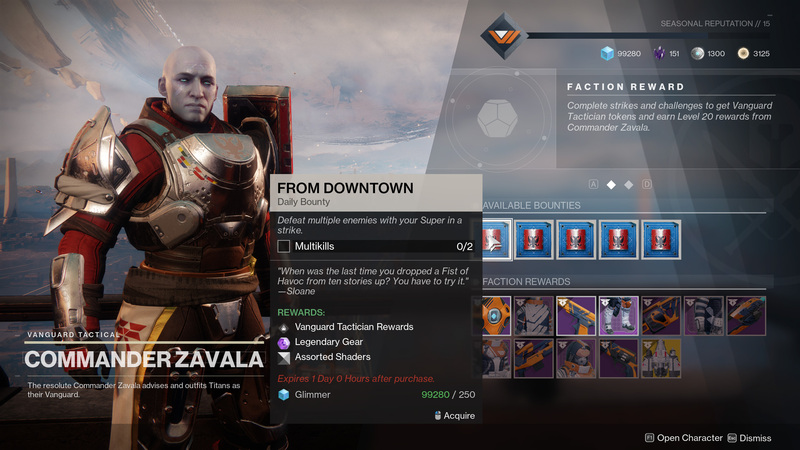 To purchase all five bounties from either character would require 1,250 Glimmer, or 2,500 Glimmer for those who purchase all 10 bounties available between both Shaxx and Zavala. This is a relatively minor investment that should be earned back through completion of the bounties. To review the bounties already purchased and active for your character, open your inventory through the character screen and browse to the pursuits tab. This will show all active bounties, and placing the cursor over a bounty will show its description and progress toward completion. 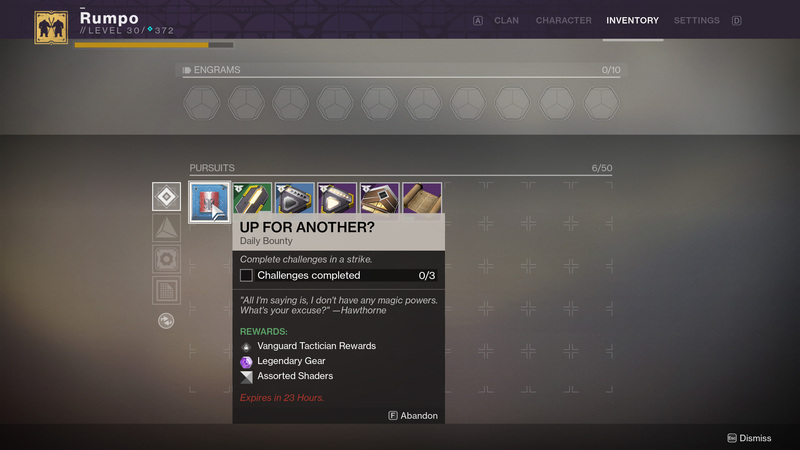 Now, there are a lot of slots on this tab, so there should be no issues with buying all 10 available bounties and fitting them in a Guardian’s inventory, but I wasn’t about to drop the 2,500 Glimmer to find out. Yeah, I’m cheap like that. I also had no desire to complete the 10 bounties today, which brings us to the rewards. If the bounty is from Commander Zavala, Vanguard Tactician rewards are possible. If the bounty is from Lord Shaxx, Crucible rewards are possible. These rewards include anything in the Crucible or strike loot pool, although it’s unlikely any of the rewards will drop at the level you’d expect from a powerful engram. In simple terms, don’t expect to increase your Guardian’s power through bounty completion, unless you haven’t yet reached anything close to the max power level. Even the legendary gear that drops is unlikely to push your power levels forward, although I haven’t tested it extensively to find out for sure. The assorted shaders aren’t really a reward so much as a major pain when you must delete them manually to clear room for more shaders you don’t want in your inventory. As of right now, the motivation to acquire and complete bounties is tied to the fact you’re already participating in the activities that they are related to, and worst-case scenario is you end up with extra Legendary Shards. When a bounty is complete, Guardians will be able to claim the rewards directly from their inventory, saving a trip to the Tower to speak with the vendor who handed it out. If you receive and engram you’ll be forced to meet with a Cryptarch, but you probably have to talk one of those anyway. The Destiny 2 bounty system should be expanded when the Forsaken DLC drops this September. For now, be sure to visit the Destiny 2 complete strategy guide for more help on maximizing your potential as a Guardian.